Learning Spanish in Madrid is a once in a lifetime opportunity where you will get to experience the energy, vitality and rhythm of the hustle and bustle of life in Spain´s capital. Madrid is charming and full of history; everywhere you look there is a perfect blend of modern and traditional architecture in a very cosmopolitan city. 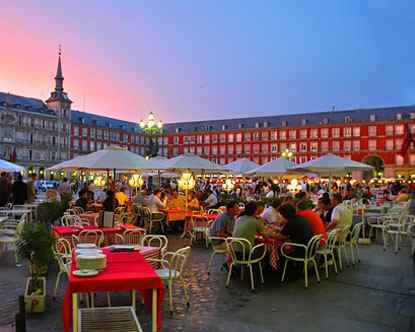 Located in the centre of Spain, Madrid is the biggest city in the country with close to 4 million inhabitants. Its perfect location makes it an ideal place to learn Spanish. Apart from being able to enjoy the exciting city life, you will also be able to visit many other enchanting cities thanks to the high-speed trains. Cities like Cordoba, Seville, Malaga, Valencia or Barcelona are a mere 3 hours away! 600 metres above the water, Madrid’s climate consists of chilly winters, warm summers and precious blue skies that always cover the city. Madrid is full of entertaining places. 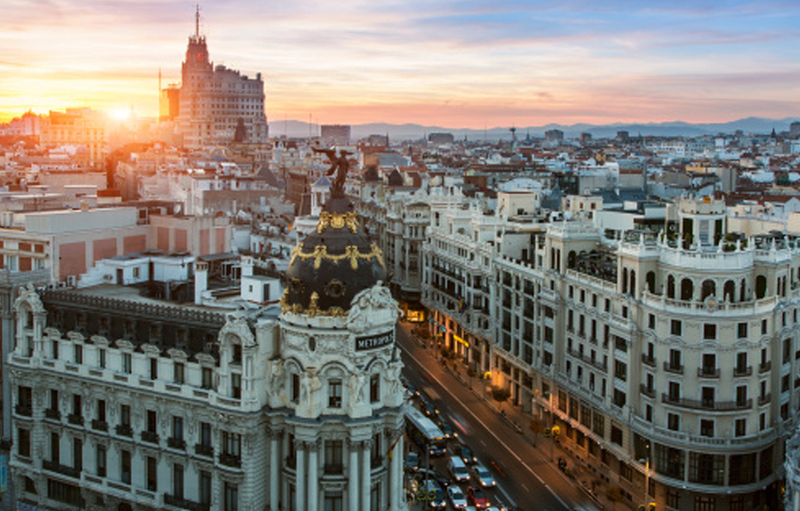 In the time you are not learning Spanish, you could be taking advantage of everything Madrid has to offer: cinemas, theatres, parks, zoos, theme and water parks, ice rinks and even indoor skiing slopes. 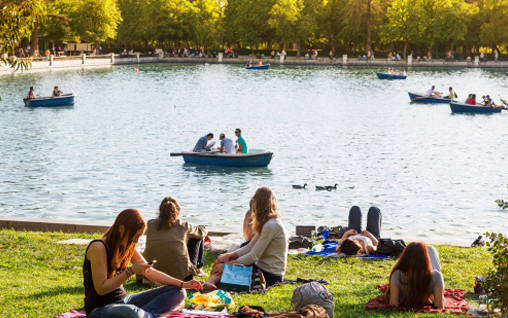 If you are going to learn Spanish in Madrid we strongly recommend visiting the Retiro Park, the biggest urban park of Madrid. It is ideal to do sports, walk or simply relax and be in touch with nature. Our very own Hyde Park! There are more than 40 museums and hundreds of monuments spread throughout the city of Madrid. As a visitor you have to see the iconic monuments such as the “Puerta de Alcalá”, the fountain of Cibeles, the city hall, the Puerta del Sol and the bullring in Las Ventas. If art is something you are passionate about, Madrid is the European landmark due to the “Paseo de Arte” road. This road contains three of the biggest Museums: Museum of Prado, Museum of Reina Sofía and Museum of Thyssen-Bornemizsa. These museums are all within a short walking distance of eachother and are a must if you are coming to study in Madrid. Reward yourself by going to see absolute masterpieces like the works of Goya, Velazquez, Picasso or Sorolla. The Rastro market: Sunday outdoor market where you will able to find anything you can think of. A jemstone for the lovers of antiques and crafts! There are fantastic bars and restaurants in Madrid, ranging from the most traditional pubs to extremely avant-garde restaurants to traditional food from the north of Spain to Thai food. All of them have a special place in the capital of Spain. If you want to enjoy the tapas culture, we recommend visiting the San Miguel market; a recently refurbished area where you can find various different types of tapas and also the best beers and wines. It is the perfect place to enjoy the company of your friends. 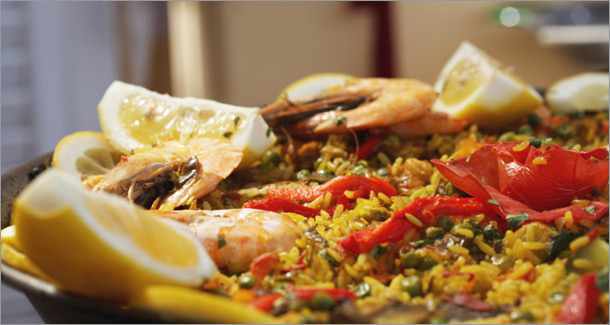 You can find all the bars and restaurants imaginable in Madrid … Come and explore! 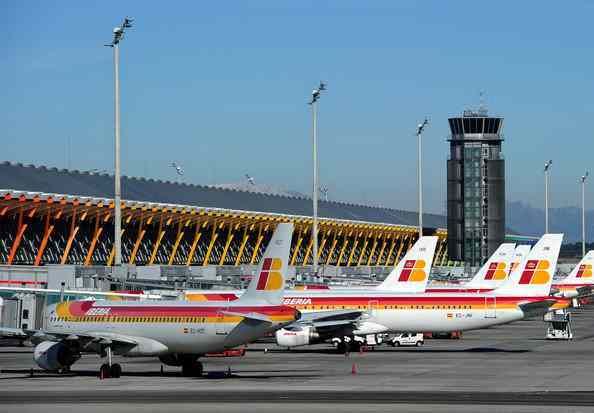 Learning Spanish in Madrid has many advantages and one of these is having an airport that is claimed to be the best in Southern Europe. The connections between the airport and the city are fantastic since you can travel by metro, train, bus and taxi. 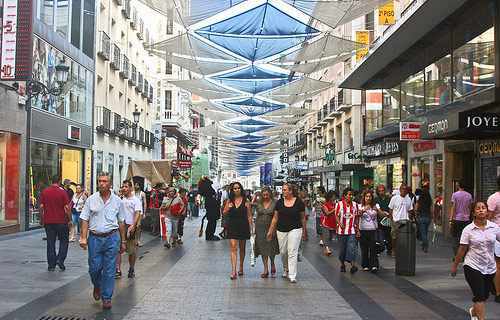 Madrid is a reasonable city compared to other major capitals such as London, Paris or Rome. 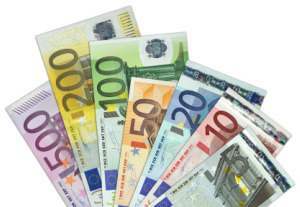 Having a cup of coffee can cost anything from 1€ and 1,80€, a three course meal in Madrid tends to cost between 9€ and 15€ depending on the establishment. A delicious and traditional chocolate with churros costs between 3€ and 6€. Travelling by the underground is also fairly cheap since a single ticket costs between 1,50€ and 2€ and the monthly underground-bus ticket costs 35€ (if you are under 25 years old). If you want to watch a film in one the many modern cinemas in Madrid, the entrance fee is 5€-10€, depending on the day and time. Like every capital, there are areas that are cheaper than others, making it very likely that you won’t face any financial strain. Learning Spanish in Spain is within your reach!